Pets are like our children – we feed, nurture and lavish attention on them. Our highly-trained kennel attendants will give your pet the same care and attention when you’re away. Our staff will provide your dog or cat with tender loving care and supervised outdoor playtime to keep them happy and active. Cat owners take the time to feed, nurture, and lavish attention on their fabulous felines. Our highly qualified kennel attendants do the same when you can't be there. We will provide your cat with tender loving care, including brushing and cuddling to keep your feline friend happy and healthy. Dog owners take pride in feeding and nurturing their best friend. Our highly qualified kennel attendants do the same for your dog when you can't be there. We provide tender loving care, including brushing and cuddling, and supervised outdoor playtime to keep your dog happy and healthy. Please note that all pets staying with us must be current on vaccines and be free of external parasites. We require that all pets are up-to-date on their vaccines at least a week before they enter our boarding facility. Please also note that space will fill up quickly over long weekends and holidays, so we encourage you to make your reservations as early as possible. 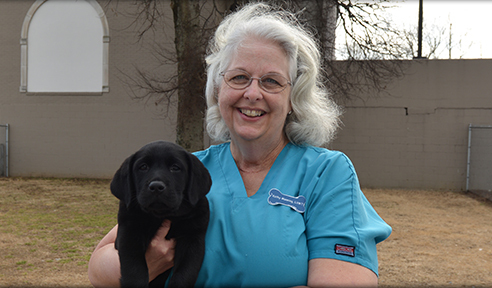 To learn more about our boarding services, or to schedule a boarding appointment for your pet, call us at 615-352-4370.